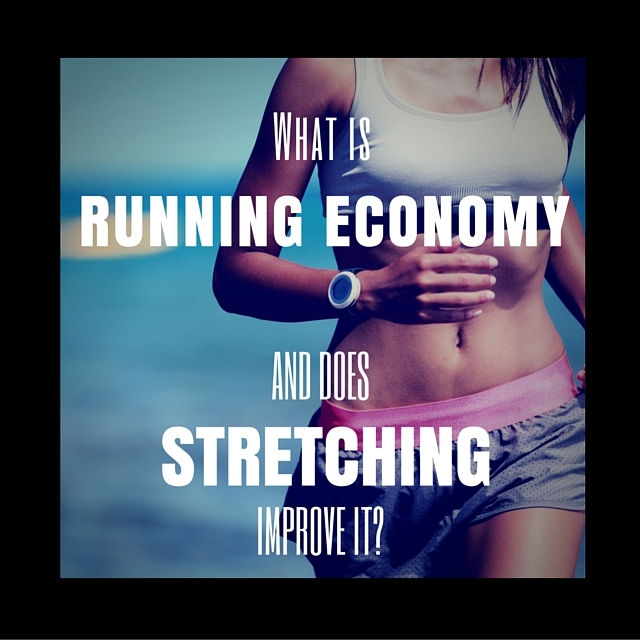 Blog What is Running Economy and Does Stretching Improve it? Running economy has been called the “secret” to running faster and farther in a race. It’s basically how efficiently your body uses oxygen. Think of two runners in a race, neck-and-neck during the last mile. One runner is breathing normally and the other is gasping for air. The runner who isn’t sucking wind has the greater running economy and will likely win. This is different from VO2 max, or aerobic capacity, which is the maximum volume of oxygen your body can use. So basically, it’s not how much oxygen you use- it’s how you use it. Think about the fuel economy of a car. Basically, the amount of gas it takes a car to travel a certain distance and the many factors that can affect it (A/C or not? Freeway or city roads? SUV or compact car? Engine mechanics?). The way your body runs is similar. The “fuel” is oxygen. What are the factors that affect its use? Researchers have suggested that several factors influence running economy (RE for short). Some of these factors, like running technique, can be modified. Some, like height, can’t. Researches do suggests that as little as a 1-6% improvement in RE would lead to a 1-6% increase in running performance. So even trying to change modifiable factors can make a runner better. Static stretching before a run? Might not be good for running economy. This study published in 2010 showed that static stretching (holding a stretch for 30 seconds or longer) before a race actually decreased running economy. Athletes that did static stretching before their run didn’t as far in 30 minutes as compared to others. However, not every study has shown the same result. Some research shows that pre-run static stretching has no effect on running economy. Regardless, dynamic stretching may have a greater benefit. Stretching after a run or on “off-days?” Probably good for running economy. Increasing flexibility of these muscle groups 2-3 times per week can improve running economy. Don’t overstretch: Being inflexible (to a certain extent) may actually help performance. An athlete’s muscles may work better when they are a little tight. Muscles are like springs- when they stretch too far, they don’t work as well. It’s always best to keep a little tension in the spring (i.e., the muscle).